Meghan Markle chose for her wedding ensemble a classic, long, white gown created by British designer Clare Waight Keller, the first female artistic director at the French fashion house Givenchy. "Ms. Markle and Ms. Waight Keller worked closely together on the design. 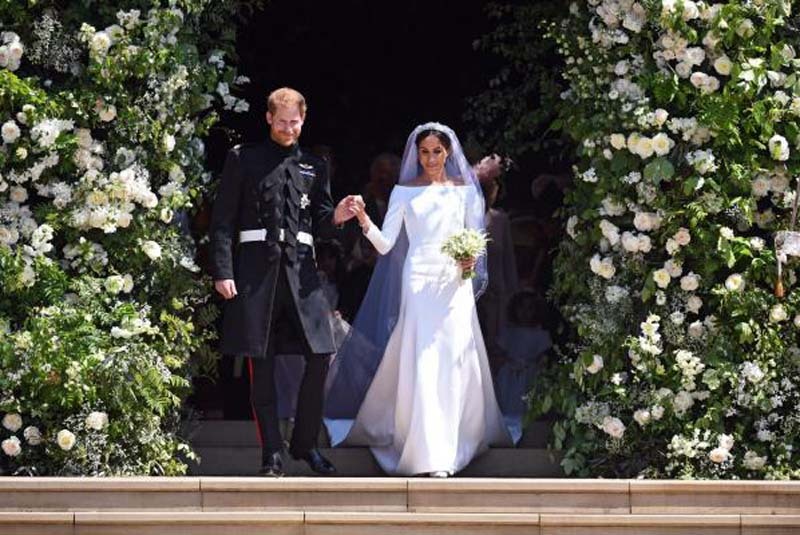 The dress epitomizes a timeless minimal elegance referencing the codes of the iconic House of Givenchy and showcasing the expert craftsmanship of its world-renowned Parisian couture atelier founded in 1952," Kensington Palace said in a statement. Waight Keller also designed the bridesmaids' dresses and page-boy uniforms. The bride's veil was held in place by a diamond bandeau tiara, which was lent to Markle for the special occasion by her new grandmother-in-law, Queen Elizabeth II. It previously belonged to the monarch's grandmother -- Queen Mary -- who left it to Elizabeth when she died in 1953. The tiara was created in 1932 and the center brooch dates back to 1893. Markle married Britain's Prince Harry at Windsor Castle Saturday. They announced their engagement in November after dating for about a year. Harry and his brother Prince William, who served as Harry's best man, wore the black frockcoat uniforms of the Blues and Royals.